Torrential rains in France last June caused extensive flooding, closing museums in Paris including the Louvre, cutting power to parts of the country, and temporarily driving 3,000 people out of their homes in the city of Nemours. Mélanie Vallui and Laureline Gérard created this story map to educate school children about flood risk. The French have long dealt with devastating floods, one of the worst being the so-called Great Flood of Paris in 1910. However, French residents need to be better informed about the risks of major floods, according to university students Mélanie Vallui and Laureline Gérard. 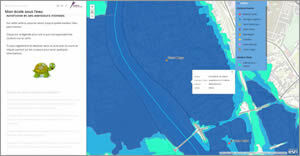 To help young children better understand the dangers of flooding in their communities, Vallui and Gérard—with help from fellow master's degree students Rémi Mayou and Léo Brisot—created the Esri Story Map Journal My School Underwater, or Mon école sous l'eau in French. The inventive and interactive story map includes a video that shows 3D flood scenarios for each of the eight schools in the community of Alfortville, France, and a map created with Esri ArcGIS that shows how far floodwater from the Seine river could rise and inundate the schools. Françoise Lopez from Esri France interviewed Vallui and Gérard about their story map, which won first place in the recent story maps contest, sponsored by Esri France. Lopez: When did you make your story map, and how did the project come about? This map shows the location of several primary schools in the community of Alfortville that would be surrounded by floodwaters if the Seine rose too high. 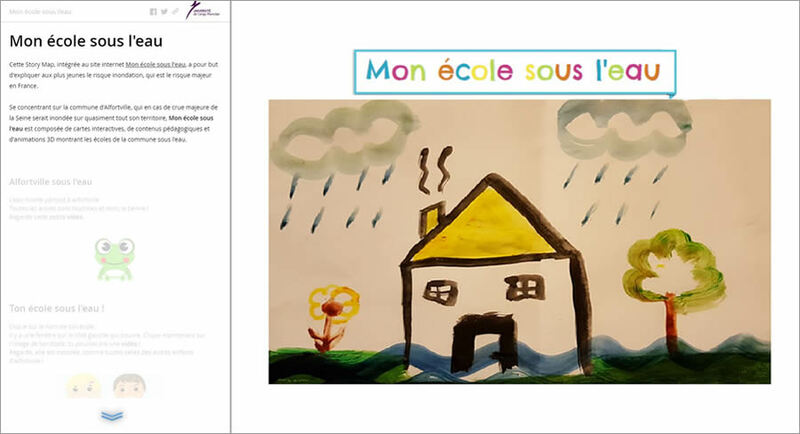 Vallui and Gérard: We created the Mon école sous l'eau story map and a complementary website in January 2016. At the time, we were second-year master's degree students majoring in GIS at the University of Cergy-Pontoise. 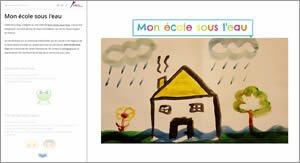 The story map was developed as part of a study project and is now incorporated into the Mon école sous l'eau educational website for children, which provides additional information about floods and how they can be prevented. 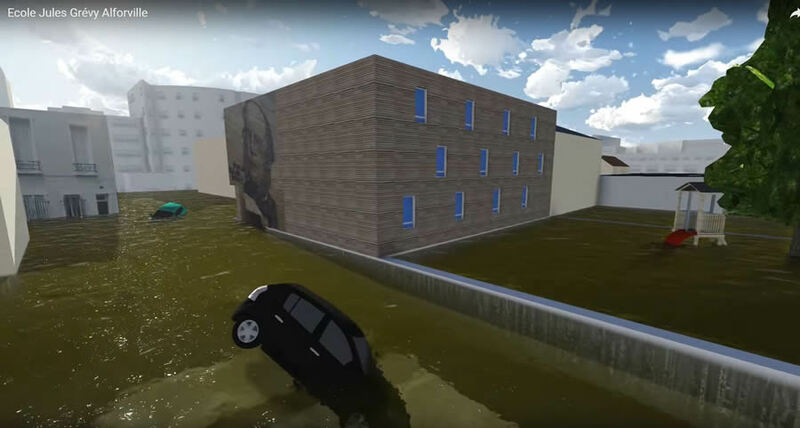 The website and story map show—through narrative text, maps, artwork, 3D models, and videos—the risk of flooding, in a format designed to appeal to young people. Included are interactive videos showing the Alfortville schools under flood conditions and educational material explaining flood risk. We have modeled eight French schools in 3D using SketchUp software. We did this modeling ourselves with the help of two friends and fellow students, Rémi Mayou and Léo Brisot. Lopez: Why did you create a story map about flood risk that was geared toward children? Vallui and Gérard: During our geography studies and particularly while we were pursuing our master's degrees in GIS, we studied flood risk several times. The risk of flooding is a major problem in France, yet most French people are unaware of this. As we saw during the floods that occurred in the Île-de-France region in May and June 2016, many people are still surprised to see rivers breaking their banks near their homes. Communication about this type of risk by officials is not necessarily effective. 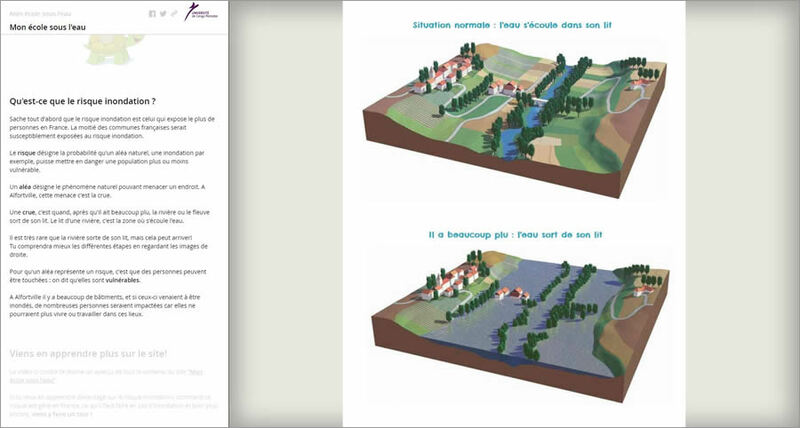 This illustration shows the Seine when the river is at a normal height and then at flood level. We thought people should be informed of the risk, starting at a very young age. The story map and website are aimed at children aged 6 through 12. At this [stage], children absorb a lot of information. When they return [home] from school, they explain to their parents what they've done in class. If our website is used by teachers, children and parents will be aware about the flooding risk and know how to respond when it floods. They will know what to do before, during, and after the flood. Mon école sous l'eau is more than a story map—it's [also] an educational website for schoolchildren. The story map is incorporated into the website to make the latter modern and attractive. Positioned prominently on the website's home page, it gives children an intuitive, original tool to use to study flood risk. Lopez: What type of information do the story map and website contain? The story map also includes two interactive maps. The first shows the position of the eight primary schools in Alfortville located in the flood-risk area. When you click on a school, a video appears and you can see the flooded school modeled in 3D. The second interactive map is composed of the flood layer showing different levels of flooding [1 meter, 2 meters, or greater than 2 meters]. 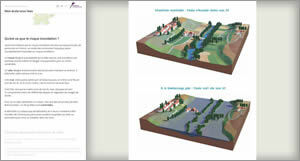 The two maps combined enable teachers or parents to introduce the concept of flooding and water levels to children. Trimble SketchUp was used to create a 3D model of a school surrounded by floodwaters. We then defined words associated with flooding. We explained the meanings of a risk, a natural hazard, and a flood and explained the concept of flood vulnerability. It was very important for us to make the science behind the risk understandable to children. They are the adults of the future and therefore must be made aware of the risk of flooding in their communities from a young age. Lopez: Why did you select the Esri Story Map Journal app to create your story map? Vallui and Gérard: We used the Esri Map Story Journal app [because] we wanted a simple format which would be easy for children to use. Lopez: How long did it take you to create the story map? Vallui and Gérard: The story map content took approximately two months to build. Creating the 3D models of the schools took much more time. Creating one model could take a week of work or more. We were beginners at using the Trimble SketchUp software at the time we created the models. Moreover, we also had other classwork to do while we were working on this project. Creating the interactive maps also took additional time, as we had to clarify some of the data for the layers used so that it would be easily understandable for children. Lopez: How did making the story map benefit you as students? A pop-up on this map shows the water level at two meters near Victor Hugo School. Vallui and Gérard: Making this story map enabled us to acquire technical skills in 3D [modeling] and find ways to make the science behind the risk understandable. However, what has struck us the most is the recognition our work has received. We promoted the story map by entering the story maps contest at SIG 2016 and won first place. We also participated in the poster competition at the same conference and took third place in the educational poster category. We also won first place in the public category and first place in the master category for the Mon école sous l'eau website at the 2016 International Geography Festival in Saint-Dié-des-Vosges, France. Therefore, the story map was widely publicized during these two events, which are well-known among geographers and geomaticians. Lopez: Are teachers using your story map and website? Vallui and Gérard: We met two teachers from one of the Alfortville primary schools. This meeting happened purely by chance during the 2016 International Geography Festival at Saint-Dié-des-Vosges, where we presented our Mon école sous l'eau website. The teachers came to our booth and told us that they had used our website and the story map in their lessons. We were absolutely delighted to learn that our project is being used by some teachers in the Alfortville schools, as—up [until] then—we had not had any feedback from teachers. We had achieved our aim: instill an understanding of flood risk in primary-school children. Several people contacted us for more information about our project. For example, several towns are interested in having this type of site and a story map about the flood risk in their community. 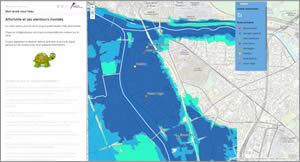 Moreover, we have been contacted by the General-Secretariat of the Paris Defence and Security Zone [which implements crisis management plans during a flood] as part of its PLOUF 75 program. The program, which educates youth about floods, was looking for students to be "risk ambassadors." which will be held at the end of April 2017). We will offer educational workshops about flood risks during the event. We are very proud of the work we did and that the project has been widely recognized. Our aim is that everyone, starting from a very young age, should be aware of the dangers of flooding. We have achieved our goal.